Cancer treatment is treatment plan designed to potentially cure cancer using one or a combination of interventions. Complete destruction of cancer cells without damage to the rest of the body is the goal of treatment. However healthy tissue can be destroyed during the treatment process but healthy tissue have the ability to regenerated or repair themselve. Individuals are unique beings with unique circumstances and biological factors thus treatment options vary from person to person. The choice of treatment depends upon the location, size, grade, and stage of cancer, as well as the general condition of the patient. Before each treatment option is commenced the oncologist (cancer specialist) will discuss available treatment options, the anticipated outcomes, possible side effects, care and follow-up during and after treatment with the patient and or familiy. Due to advances in medical science there have been many breakthroughs in the treatment of cancer enabling more and more patients to have a better chance of long-term survival. It is surgical procedure done to remove a diseased organ or tissue. In addition to removal of the diseased organ or tissue surgery is also necessary for determining the extend (stage) of the cancer and whether it has metastasized (spread) to other parts of the body. Staging is a major determinant of prognosis and for the need for treatment. Occasionally, surgery is used to control symptoms thus improving the quality of life for cancer patients. If surgery is possible and appropriate, it is commonly done before other forms of treatment although the order does not affect the outcome. The goal of surgery can be either the removal of the tumor or the entire organ. In some cases surgery is delayed until other treatment options are able to shrink the growth. Radiotherapy treatment (also known as radiation therapy) is the use of radioactive rays to kill cancer cells and or shrink the growth. Radiotherapy can be given externally or internally. 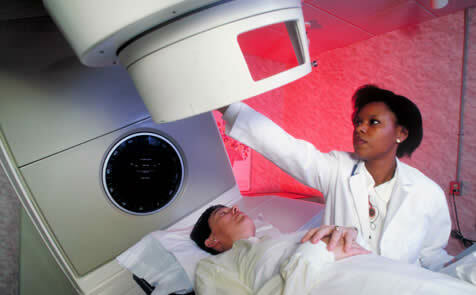 The effects of radiotherapy are localized and confined to the region being treated. The goal of radiotherapy is to destroy the cancer cells in the area being treated or targeted and making it impossible for these cells to continue growing and dividing. However, during this process normal cells are also destroyed. Although radiotherapy damages both cancer cells and normal cells, most normal cells can recover from the effects of radiotherapy and function properly. The goal of radiotherapy treatment is to destroy as many cancer cells as possible, while limiting harm to normal tissue. Chemotherapy is the treatment of cancer using drugs (anticancer drugs or cytotoxic drugs). These drugs have the ability to destroy cancer cells. Like radiotherapy, chemotherapy has the potential to harm healthy tissue but healthy tissues usually repair themselves after chemotherapy. Because some chemotherapy drugs work better together than alone, two or more drugs are often given at the same time thus most chemotherapy regimens are given as combination. Chemotherapy can be given orally or intravenously. Hormonal therapy or hormone therapy is the use of hormones in the management of cancer in both male and female patients. The growth of some cancers can be inhibited by providing or blocking certain hormones. Some examples of hormone-sensitive tumors include certain types of breast and prostate cancers. The removal or blocking of estrogen or testosterone is often an important additional treatment. While hormone therapy does not cure patients from their cancers on its own, it can relieve symptoms. Although the control of the symptoms of cancer and other life threatening illnesses is not usually thought of as a treatment option, it is an important determinant of the quality of life of cancer patients, and it plays an important role in deciding treatment options. Palliative care is specialized medical care for people with life threatening illnesses cancer included. The goal of palliative care is to relieve symptoms, pain and stress of the disease and improve the quality of life for both the patient and the family. Palliative care is provided by a team of doctors, nurses and other specialists who work together with the patient and family. It is important to introduce palliative care early in the course of the illness in conjunction with other treatment options such as chemotherapy or radiation. For more information: Visit the Cancer Association of Zimbabwe at 60 Livingstone Ave, Harare Tel. 707444 / 705522 / education@cancer.co.zw or your nearest health facility.